We just came out of another minimum. I will say again, I do not have a problem with caring for the environment, I have a problem with knee-jerk legislation that is not based on solid science. There is no reason to throttle the world so hard. The other point that to me totally blows away the reality for some agenda is this. IF global warming is such a problem them ALL NATIONS should be held to the same standards. YOU DO NOT lower emissions by allowing a company to buy from a country that has next to nothing in emissions credit to continue to produce at the same level they are now. That is pure wealth redistribution. Johnny's house has a spring fed well in it. David's has a river with runoff from snow. Since Johnny's will deplete the well eventually, maybe, he is told that he cannot take as much from the well unless he pays David for credit on David's constantly renewed river. And by paying Johnny keeps taking from the well he has since David is on the other side of the world and is just living in a mud hut and has no need of that river other than drinking water. Johnny on the other hand has a big factory that takes the water from the well and pollutes it. You have NOT stopped emissions with Carbon Trade. If the problem is CO2 and other emissions then you have failed to stop it or slow it, the company just buys credit to continue at current rates it is polluting and now some poor backward country has more money in it's pocket. Since most are in Africa, some warlord who is playing dictator gets more money while still standing on the throats of his people. Outstanding post! Mega dittos. Once you think it through, the agenda is so transparent, isnt? Communism. And its stated goal of transcending national borders. Since Communism wasn't a social force until the 20th century, attributing to it something that started 50 years earlier would be a neat trick. BTW, Cleisthenes, you are full of self denial. First, your graph shows an 8,000 year cooling trend. This means the overall trend of cooling remains the case. There you go with the projection again. When have I ever denied that there was a cooling trend before the current wraming trend? You on the other hand, repeatedly deny what is right in from of your face. Second, in that 8,000 years there is variation, including the last 150 years. Small variations yes, but nothing like the 1 °C warming in the last 150 years. Third, the normal variation of relative warming your graph shows in the last 150 years, does not make up for the previous 7, 850 years of cooling; meaning it is cooler now than your graph shows it was 8,000 years ago. I'll post the graph again so you don't have to go searching for it. Now, take a close look at the arrow on the right showing where temperature was in 2004 and tell me again how much cooler it is now than it was 8,000 years ago. Fourth, you want use the last 150 years where warming is shown to supersede the 8,000 year trend; meaning you want to use 1.9% of the data to reach your politically driven decision, while ignoring 98.1% of your own data. This from the person who presented a single temperature from a single city to refute global warming. You know know how to interpret trends in data, do you? Would you also argue that our economy is not stalled because the last 5 years is superseded by the previous 200 years of growth? I must agree with John Locke here all; this post points out the whole agenda for these socialistic/communistic, green, green, incompetent machine kooks. He has pointed out succinctly how it is a transfer of wealth scheme; nothing more, nothing less. I do not know if Cletheines or whatever is his name is, resides in the United States. But here is something very obvious-------->these policies are discriminatory! To say certain countries have to do certain things to save the world, while others whos pollution is growing by leaps and bounds do not, is just a joke. It is the same old, same old, from you people-------->put up a bunch of graphs, try and convince the United States that it is the problem, then let others do whatever they want while charging us for it with a carbon tax, lolol. You must really think we are all dumb, or that you can scare enough people to buy into your religion. All a communist is, is a green socialist who really means it! P.S. Oh by the way, did you see the article that states that your hero, Al Gore; will probably be the 1st green billionaire? Seems he only had 20 million or so when he left the vice presidency, but his cars, his homes, his planes, and his fortune is growing, lololol. You don't think he could be doing this for the money do you? Naaaaaaaaah! You don't think after his book was proven bassackwards like all your green statements, he found new evidence do you? Naaaaaaaah! He has such a large carbon footprint, but you guys love him! He is the poster child for the saying------>if you tell a lie long enough, people will begin to believe it. But Al Gore added to that saying------------->and then you can make money off their stupidity. You do realize that Karl Marx - 5 May 1818 – 14 March 1883 - He had a LOT of influence and "social force" during and since his lifetime. The Russian Revolution - 1905 over 100 years ago established a Communist country. That does not just happen over night. There has to be a building up to it. You show a propensity to play word games in order to avoid that you are wrong. ESTIMATED which means you could be wrong and most likely are. If you average an estimate it is still an estimated average not a definitive fact. Funny that graph looks like it was hotter 8000 years ago than now. Though again since we are estimating and average it could be either way. Your own graph shows it is cooler so how are you trying to say it is hotter? Economy and global weather are two different things. Biggest difference is that we can affect directly and with speed the economy. The jury is still out that we can make such an impact on the weather. Karl Marx didn't become a significant "social force" until he met Friedrich Engels in 1844, and even then his influence was focus primarily in Germany and France. Communism itself didn't become a "social force" until the early 20th century, and even then I seriously doubt manipulating global temperature records was very high on their list of priorities. I still don't see where on this graph the thick black line rises above the current 0.5 °C temerature anomaly pointed out on the far right. If you're refering to any of the thin colored lines, then you obviously don't understand what the graph is depicting. Economy and global weather are two different things. Yes, but how we detect trends in each is not. Opinion not fact. You really should learn the difference. I am not saying my statement about Communism is FACT I am stating that it is notably before 1900 that his influence is felt as a "social force"
I printed it out to use a straight edge to make sure. 8000 years hits pretty much were the dotted line is on it's way UP. When you apply the straight edge and use care to make sure it is parallel to the dotted line it is higher at about 7750 (guesstimate on that is the date at that high point in temperature) than it is now. I am not sure what your lines mean but it seems you are talking about the thick black line. Since your graph has nothing but years and temperature anomaly I really don't know what all those lines mean. Maybe if you actually put the break down of what each line was it might present some sort of information. What are the brown lines, the yellow lines etc. You expect us to believe that it has JUMPED about 3/4s of a degree in on the scale shown is effectively an instant. All that with no attribution to the rest of the lines or context? Just your word on it. BTW The biggest thing you IGNORE is that we had a cooling point approximately 10,000 years ago. You completely ignore that in general the earth has been WARMING SINCE THEN. So if it is warming anyways as a cycle from cold to hot, how do you know that if humans weren't around at all that the earth might still be on a warming trend since then. You have no valid data that it is ONLY humans that are contributing to the warmth. For all we know we could still be looking at a few thousand years of warming before the earth starts cooling again on cycle. 200 years compared to 8000-12000 is nothing more than one second in time and therefore not a valid enough slice of the whole to determine if we truly have been affecting it. The thick black line represents an average of eight different local temperature reconstructions depicted in different colors. The dashed line down the middle represents the mid 20th century mean gloabal temperature. Each temperature reconstruction comes from an ice core or bore hole and shows the temperature change at the specific location only. While local temperature can and has varied greatly, the global mean temperature has been much more stable. You should check the calibration on your straight edge. 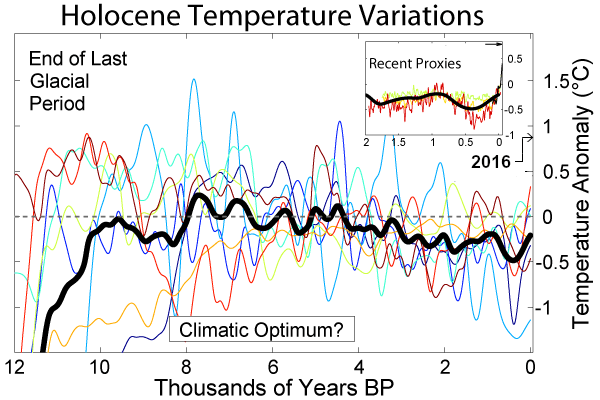 The peak you pointed out around 7,750 YBP shows a global temperature anomaly of about 0.3 °C, commonly called the Holocene climatic optimum. Since the mean global temperature anomaly is currently about 0.6 °C, that means Earth is warmer now than it has been in the last 12,000 years. How can I be ignoring something which the data doesn't depict? Temperatures warmed from about -6 °C during the last ice age to modern levels over a period of about 10,000 years, remained relatively stable for another 5,000 years, then steadily decline for the last 5,000 years. Even the relatively sudden 0.5 °C rise around 8,000 years ago took about 500 years. Nothing in the temperature record even hints of a 1.0 °C rise in just 150 years. You are still making an estimate with different variables. The Ice cores do not show what the temperature was in death valley. They do not shot what the temple was on the african plain etc etc etc. You can only take ice cores from the locations they are now in and ASSUME a lot of things about what the cores show. If all you were doing is comparing ice cores and NOTHING else then yes you could possibly have valid data but as such you do not. If all I was comparing was ice cores from one location, then you might actually have a point. As it is, the temperature reconstructions depicted are from the Vostoc ice core in Antarctica, the GISP2 ice core in Greenland, the sediment core ODP 658 from the Eastern Tropical Atlantic, the Kilimanjaro ice core in Eastern Central Africa, Sediment core PL07-39PC from the North Atlantic, the EPICA ice core from Central Antarctica, composite sediment cores from the Western Tropical Pacific and even pollen distributions from Europe. It's not a complete sample of temperature reconstructions by any means, but sufficient to illustrate my point that global temperature isn't as variable as local temperatures. It is still a very LIMITED scope. You want to make big changes, or I should say you support big changes like the business crippling cap and trade based on a LIMITED scope of information. I do not understand how you can present a logical argument and still stick to an illogical premise based on incomplete evidence. You can say all you want but when you look at the samples AND the premise you are relying on in your own heart you know you are not being accurate. So protest all you want. You cannot scientifically support your side without cooking the books. Because my premise is not based on this one graph alone. I'm surprised that you haven't figured this out yet. You cannot scientifically support your side without cooking the books. Notice how Cleisthenes COMPLETELY ignores a major point. I wouldn't want Al Gore to cut off my subsidies, now would I? Last edited by Cleisthenes; 08-28-2013, 06:04 PM.